Visits: 33424 persons viewed this recipe. Aloo gobi masala – a very popular vegetarian dish in India, especially in the northern part of India. It is a standard item in most of the Indian restaurant menu. Potato is called ‘Aloo’ and cauliflower is known as ‘Gobi’ in Hindi. So, it is a mixed curry of potato and cauliflower. It goes well with almost all prime dishes. Here you go with the Aloo gobi masala recipe. Wash and clean the cauliflower well. Cut it into bite size florets. Peel the potatoes and cut to 1 inch pieces. Chop onion, ginger, garlic and green chilli finely. Slice the tomatoes. Heat 3 table spoon of cooking oil in a pan. Put 1 tea spoon of cumin seeds and allow them to sizzle. Put finely chopped onion, ginger, garlic, green chilli and salt. Saute it in a medium heat until it turns golden brown. Bring down the heat to low. Add coriander, chilli, turmeric and garam masala powders to it. Stir continuously for 1 minute. When it is done, put kasuri methi (optional). Remove from the heat and add 1 table spoon of butter. Taste for salt. Aloo gobi masala is ready. Transfer to the serving dish and garnish with chopped coriander leaves. 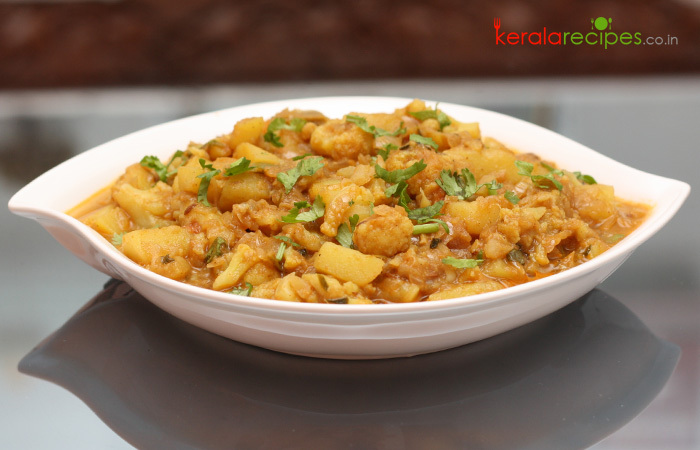 1) You can also prepare Aloo Gobi Masala by frying cauliflower and potato, then adding it to the masala. 2) Adjust the level of spices to suit your taste. Thanks for posting a non-kerala dish. going to try. Great recipe with easily available ingredients. Well done Shaan Geo ! Actually, before putting veggis into masala, if we will just fry it well then the raw smell will go and it will test a bit good. specially gobi. Yes, you are right Deepak, it will be more tasty if you fry it. To make it simple I avoid that step. Thanks a lot for the feedback. It’s very useful website for us… Thank you so much!! Thank you so much for your wonderful recipes. Could you please add the photos of each steps? It helps to prepare the items easily. Rani, Thanks a lot for the nice words and also for the suggestion. Because of the technical reasons I am not able to add more photos. If I do so, the pages will take more time to load for the users with low bandwidth internet connection. Anyway I will try to include images of important steps. Once again thanks for the feedback. Good recipes Shaan you can even try adding more snacks please. Thanks Rinda I will try to add more snack recipes. Thank you Shaan. Successfully tried this dish. I loved your recipes. They will really help in my further dishes. Thanks a lot.